The basic problem of economics - How can we make our country prosperous? - was solved long ago, in the 18th century, by Adam Smith and other thinkers of the Enlightenment. Yet some people, all these years later, still don't believe it. Economic freedom (capitalism, property rights), intellectual freedom (science and technology) and self-interest makes societies prosperous. Strong, utopian government leads to unemployment, poverty, emigration and famine. This has been repeatedly demonstrated in practice in countries all over the world. Yet ignorant thinkers continue to resist these ideas even today. Christmas in a western shopping centre. Hi-tech phones and glossy books and cafes and mulled wine. Whereas the lot of humanity for most of its history has been starvation and terror. Some people think the above is "vulgar capitalism", distasteful and repellent. But only someone who is already rich and free could think that way. 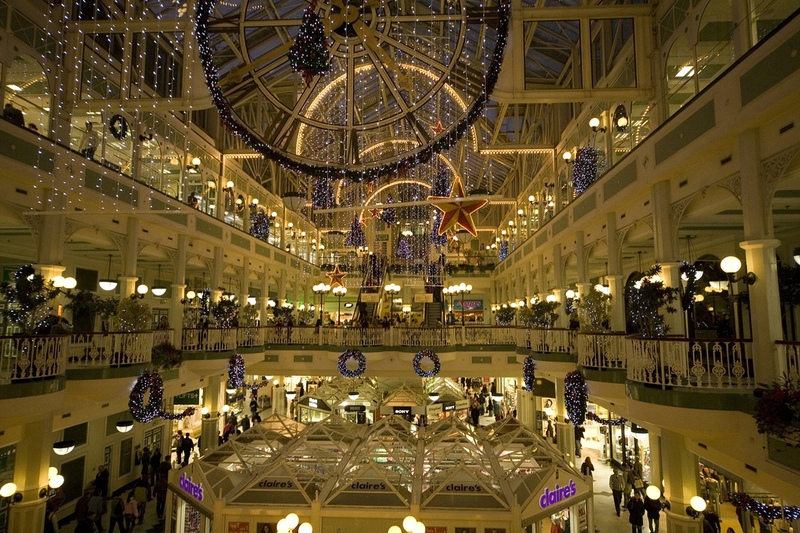 While I personally prefer the urban street to shopping centres, and while any particular shop or display may aesthetically offend me, overall capitalism has liberated us, not oppressed us, and we should be grateful every day for the well-ordered free market and property rights that have delivered all these wonderful goods to us. We are lucky, and we should be happy and grateful. The mind of the left - Why do many supposedly educated people in the West reject capitalism? It is one of the fundamental mysteries of intellectual life since 1850. Leigh Scott, 1 Feb 2010, makes a nice point about the left's criticism of capitalist "greed". "Greed is a lame scapegoat, but it's an easy one. Politicians, authors and filmmakers don't sound as pious railing on about those of us who "work harder" than others and therefore have more than the rest. It doesn't flow off the tongue as easily to assail those who have "risked greatly" and have been rewarded handsomely for their efforts. But going off on the "greedy" sure makes a great speech." Tribute to Steve Jobs, Kevin D. Williamson, October 5, 2011. He compares business with government: "Once you figure out why your cell phone gets better and cheaper every year but your public schools get more expensive and less effective, you can apply that model to answer a great many questions about public policy. ... I was down at the Occupy Wall Street protest today, and never has the divide between the iPhone world and the politics world been so clear: I saw a bunch of people very well-served by their computers and telephones (very often Apple products) but undeniably shortchanged by our government-run cartel education system. ... to the kids camped out down on Wall Street: Look at the phone in your hand. Look at the rat-infested subway. Visit the Apple Store on Fifth Avenue, then visit a housing project in the South Bronx. Which world do you want to live in?" I, Pencil by Leonard E. Read, 1958 (explained above by Milton Friedman). This wonderful essay shows how capitalism is just the way the world works, when left alone. It is what humans do when they are free. It is as old as civilization. It is a great, even heroic human endeavour, that makes incredible goods, like a modern pencil, from the combined efforts of thousands of people world wide: "not a single person on the face of this earth knows how to make me". And it is how humanity makes all of the wonderful things that make life so comfortable for the bourgeois anti-capitalist protester. Free trade creates wealth and promotes world peace. The kind of video that should be shown in schools, instead of rubbish like The Story of Stuff. Capitalism doesn't just make countries rich, while socialism makes them poor. We all know that. It's old news. But there is more: Capitalism is morally superior. The Center for the Advancement of Capitalism - Capitalism is moral because it allows people to be free to pursue their own lives and dreams. Socialism is immoral because it makes people subjects, chattel, owned by the state, which will plan their lives and tell them what to do. The Moral Basis of Capitalism (and here) by Robert W. Tracinski - Businessmen and merchants are history's heroes just as much as scientists and engineers. Adrian Rogers said in 1984: "You cannot legislate the poor into freedom by legislating the industrious out of it. You don't multiply wealth by dividing it. Government cannot give anything to anybody that it doesn't first take from somebody else. Whenever somebody receives something without working for it, somebody else has to work for it without receiving. The worst thing that can happen to a nation is for half of the people to get the idea they don't have to work because somebody else will work for them, and the other half to get the idea that it does no good to work because they don't get to enjoy the fruits of their labor." "The World Is My Toilet". Thoughts on how socialism erodes manners and morality. And how private ownership improves people's morality. "Make Mine Freedom", a simple cartoon from 1948 about why capitalism is morally superior to communism. Some wealthy, comfortable western romantics claim that "money can't buy happiness". That affluent societies are not happier. That the third world often has a stronger and better family and social life than we do. That people living simple, low-tech, rural lives are often happier than stressed urban professionals. Surveys however show that statistically this is not true. There is in fact a strong correlation between GDP and the level of satisfaction people express with their lives. The fact is that having to struggle all your life for food and shelter and survival, and watch your children struggle, and die in infancy, does not lead to human happiness. Wealth is good: The rich countries are the happiest ones. Happiness by country. From the 2015 World Happiness Report. 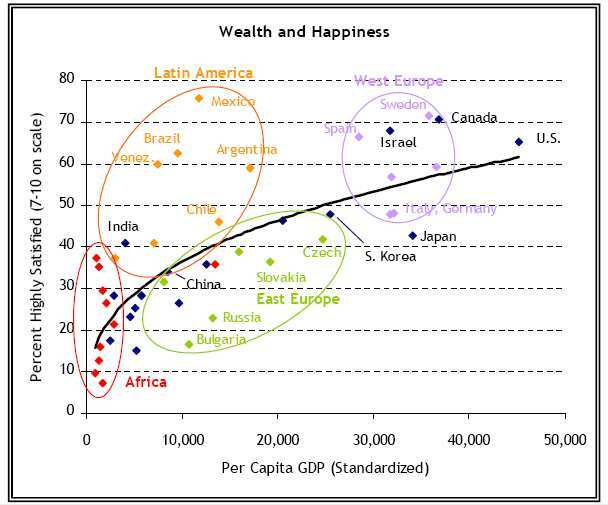 Also (statistically): Western values make you happy. Eastern values, Islamic values and traditional cultures do not make people happy. The correlation between money and happiness. From Pew Survey, July 2007. If it is true that wealth is good, and poverty is bad, then who is actually ending poverty and creating wealth? There is a central paradox of capitalism that seems extremely hard for most people to understand. It is the difference between intentions and outcomes. The New Left? - nice short post by Frank McGahon on the difference between intentions and outcomes. The left might want to end poverty and unemployment, but their policies (high tax, redistribution of wealth) actually increase poverty and unemployment and emigration. Whatever the right's intentions (and, as McGahon points out, who cares?) their policies actually reduce poverty and unemployment and emigration. So anyone who cares about the poor and about reducing unemployment and emigration should support capitalism, and should support the right. In Ireland, for example, poor people should vote for FF and the PDs, since FF and the PDs have helped the poor (by massively reducing unemployment and emigration, for example). Sinn Fein, on the other hand, is an enemy of the poor, its policies will hurt the poor, and poor people logically should not vote for it. "Most of the harm in the world is done by good people" - Certainly true when one thinks of Christianity, Islam, socialism, communism and nationalism. "Most of the good in the world has been done by 'greedy' people - people out to better themselves" - Certainly true when one thinks of science, medicine, technology, capitalism, consumer goods, media like the Internet, and the vast improvements in living standards, wealth, health and life expectancy in the last few hundred years. "Want and greed are why humanity today is freer, healthier and more comfortable than it's ever been. Nearly every significant innovation, invention or improvement that man has so far come up with resulted from the innovator, the inventor or the improver's desire to better his own condition, or, put differently, to get more stuff." Milton Friedman on greed, Phil Donahue show, 1979. In 2009 they rank Ireland 4th in the world, ahead of the UK and the US, and the freest economy in the EU. No wonder we're rich. The Heritage Foundation even referred in 2001 to the economies of Ireland, the UK, the US and Canada as the "Anglo-Celtic" capitalism model. 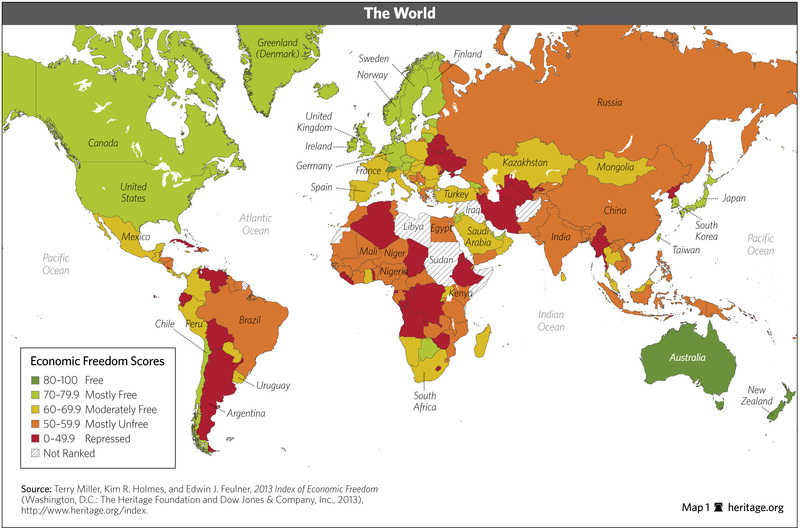 Map of world economic freedom 2013. In 2008 they rank Ireland 9th in the world. Press release, 25 June 2002 - "Africa's persistent poverty is not due to a lack of foreign aid - African nations are the largest aid recipients - but to a lack of economic freedom on the continent." 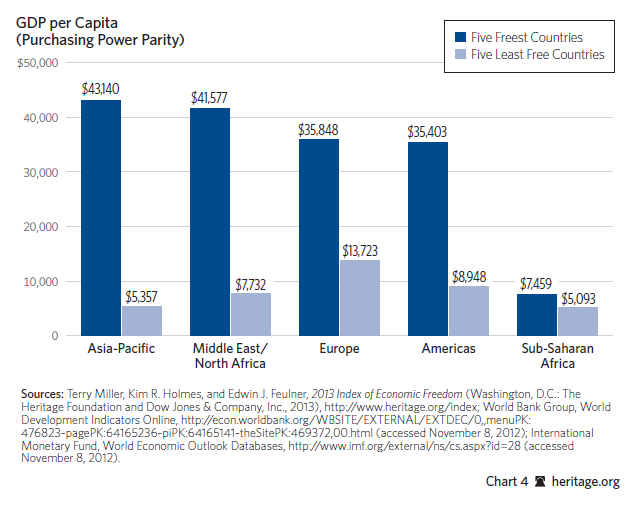 Economic Freedom of the World, 2008. In 2008, Ireland ranked 8th in the world. In 2008, Australia ranked 3rd on the "Starting a business" subindex. In Australia there are 2 procedures required to start a business, taking 2 days to complete. The official cost is 0.8 percent of the Gross National Income (GNI) per capita. There is no minimum capital investment required. In contrast, Guinea-Bissau ranked worst (181st) on the "Starting a business" subindex. In Guinea-Bissau there are 17 procedures required to start a business, taking 233 days to complete. The official cost is 256 percent of the GNI per capita. A minimum capital investment of 1007 percent of the GNI per capita is required. Ease of Doing Business Index, 2006. Green nations rank higher, red nations lower. Africa is poor because governments in Africa make it hard to set up a business there. Globalization Index 2010 ranks Ireland the no.2 most globalised nation in the world. Globalization Index 2004 ranked Ireland the no.1 most globalised nation in the world. FAQ - Is the net effect of globalization good or bad? 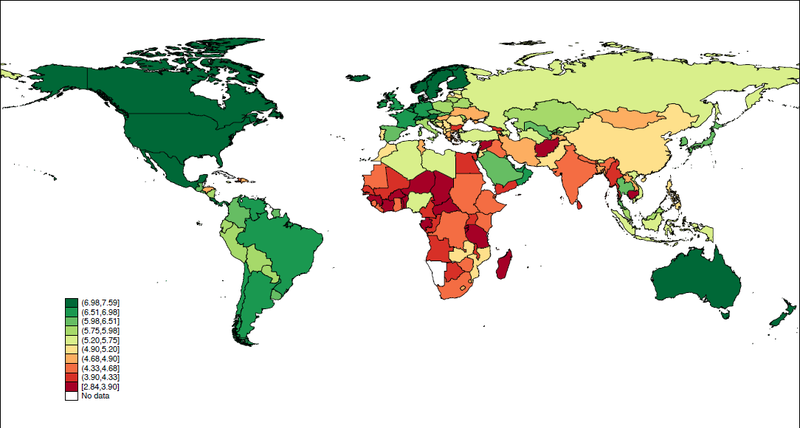 "Results in previous years challenged the conventional wisdom on such issues as income inequality, wages, environmental protection, corruption, and political freedom by showing that, on par, the most global nations are also those with the strongest records of equality, the most robust protection for natural resources, the most inclusive political systems, and the lowest corruption. Moreover, there appears to be little proof that global nations have trimmed social benefits or slashed workers' wages in an effort to get ahead. Adding to the picture, this year's results also demonstrate that the most global countries are those where residents live the longest, healthiest lives and where women enjoy the strongest social, educational, and economic progress." 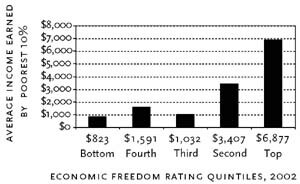 Perhaps the clearest finding in all of economics is the correlation between economic freedom and prosperity. Compare the table of economic freedom with the table of the richest countries. Socialists claim to want to make people better off. They claim to want to reduce poverty, not increase it. And yet they refuse to approach the issue scientifically, namely by seeing what actually does reduce poverty, and adopting it. If you want your country to be prosperous, the most logical thing to do is the following. Forget ideology. Forget your pre-conceptions. Simply look at the countries high on this list, and do what they do. World GDP per capita, 2007. Compare with map of economic freedom above. 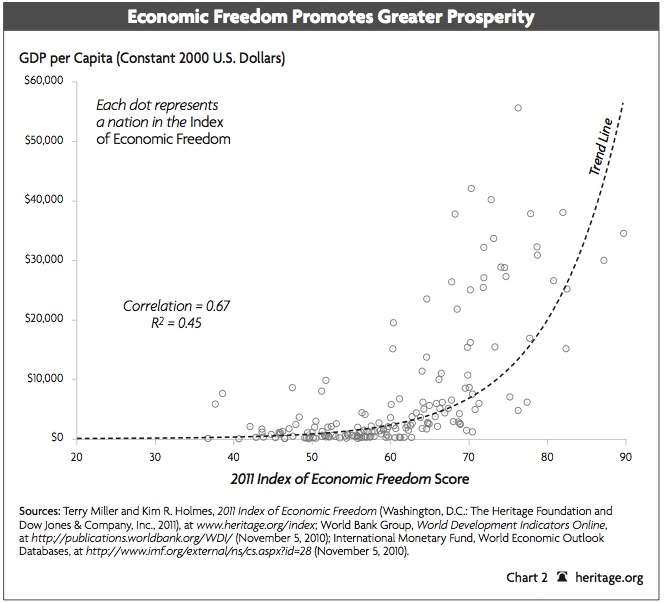 Economic freedom is clearly correlated with prosperity. Economic freedom and GDP per capita. 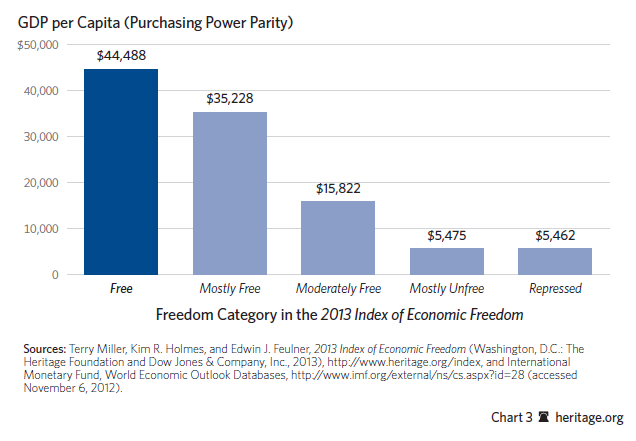 From 2011 Index of Economic Freedom. See also 2006 chart from here. Discussion: "Heritage and the WSJ ask an important question: Cultures may differ around the globe, but the pursuit of prosperity is universal. Might the key to prosperity be universal as well? The answer has to be 'Yes'. ... The message is clear: allowing people the freedom to keep their money by lowering taxation, the freedom to trade by removing trade barriers and defending property rights and minimal regulation is more effective in alleviating poverty than any number of NGOs"
From 2013 Index of Economic Freedom. See also 2002 chart from Robert A. Lawson. Economic freedom and GDP per capita, by region. 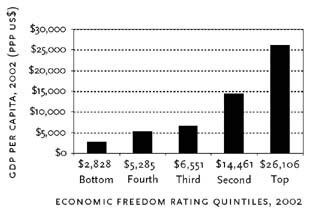 Economic freedom and the wealth of the poorest 10 percent. 2002 figures. From Robert A. Lawson. 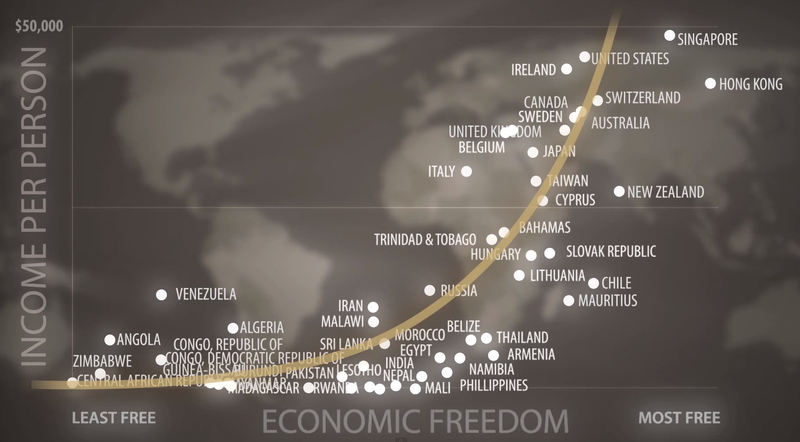 Economic freedom makes countries rich and happy. Video: "Economic Freedom & Quality of Life". From Charles Koch Institute. The graph above showing country names. Rich is Beautiful: A Very Personal Defence of Mass Affluence, Richard D. North, 2005. He has an optimistic, life-affirming philosophy, like me. He wants everybody to be rich, and to be happy and grateful for it, not guilty and negative. Extract - "I like an argument that suggests that the West is just plain fortunate, and perhaps we in the Anglosphere are especially so, and that we will enjoy ourselves much more when we recognize it and are grateful for it. Lucky people ought to be gracious, and grateful, and if modern society has a failing, it is that we are not yet enjoined to be either. Our intellectuals, artists, and "role models" tend to line up with the complaint, not the celebration." Polish man wakes up in 2007 after being in a coma since 1988 (and search) - He is a powerful reminder of how little we appreciate the wealth and variety that global capitalism has brought us. And how little we appreciate the strong anti-communist forces that defeated communism and liberated Europe. "When I went into a coma, there was only tea and vinegar in the shops. Meat was rationed and there were huge petrol queues everywhere. Now I see people on the streets with cellphones and there are so many goods in the shops it makes my head spin." And yet people still complain: "What amazes me is all these people who walk around with their mobile phones and yet they never stop moaning." "The world is prettier now" than it was under communism, he says. "This place is amazing! You can't imagine! The schools, the hospitals! The way they live! And nothing's done by hand! Even the baking! Even cleaning the street! They have these little carts ... you just press a button. The police! They smile at you and say 'Hey!'" "If we had just a fragment of this development in Uzbekistan ... If I could take just a tiny part of this when I go home ..."
"Here in Sweden there are laws. And even the government obeys them! There was a minister who did not pay his TV licence - and he [sic] lost his job. Can you imagine? And the way they treat people! We saw a prison and do you know, in the canteen, the prisoners take a tray and chose the food they want. Different salads, meats, yogurt .. everything. Fresh! In prison! Oh my lord above!" We're Closing in on World Peace (Seriously). Literacy Is at an All-Time High. Worldwide, Poverty Is Dropping at a Shocking Rate. "From 1990 to 2012, the number of the world's extreme poor was cut in .. half. In case you were wondering, that would be the first significant global decline in extreme poverty. Ever. ... And it's looking like as many as 40 countries might be able to eliminate extreme poverty within a few decades." We Are Only Happy if Other People Aren't. On being upset that some people have more: "All you're doing is murdering your own happiness, sitting in a world full of astonishing feats of goodness and genius and thinking only about how we haven't gotten rid of something (inequality) that is fundamentally impossible to get rid of." We Insist on Comparing Our World to an Imaginary One That Exists Only in Our Heads. We Focus on the Negative Byproducts of Wonderful Trends. We Don't Recognize That Flaws Are Just Alternatives to Much Worse Flaws. On utopian solutions not working: "You have to compare the world to the world, not to your imagination. And if you do that, it's actually very rare that you find a system in place now that isn't a superior version of an older, shittier system, no matter how flawed it might be. ... You have to give credit to the people who worked hard to make things less bad today"
With People More Powerful Than Us, We Only Count the Bad Things They Do. "Why would all of the things productive people produce be taken for granted? ... we just take the continued invention of these marvels as if it's as inevitable as the rising of the sun, rather than the dedicated work of people taking risks and getting up early in the morning ... in the process of hating the people who have, shouldn't we also appreciate that our homes are full of the stuff they gave us access to? ... Because to a kid living 200 years ago, this world is the Star Trek fantasy come to life. All of the information in the world is available to you via the same machine you're using to read this. Why aren't you a genius yet? What are you doing with this power?" The gilded generation - why the young have never had it so good, James Delingpole, 10 May 2014. He reflects on "our species� extraordinary inbuilt mix of ingratitude and amnesia which characterises our response to the advances of the capitalist system. ... Nowhere is this better exemplified in our own culture than in the way we have so casually absorbed the benefits of internet technology." "Everything's Amazing and Nobody's Happy". Louis C.K. on how people don't appreciate the wonderful world that capitalism and science has delivered for us. Whatever Marxist crap they spout, people vote with their feet. 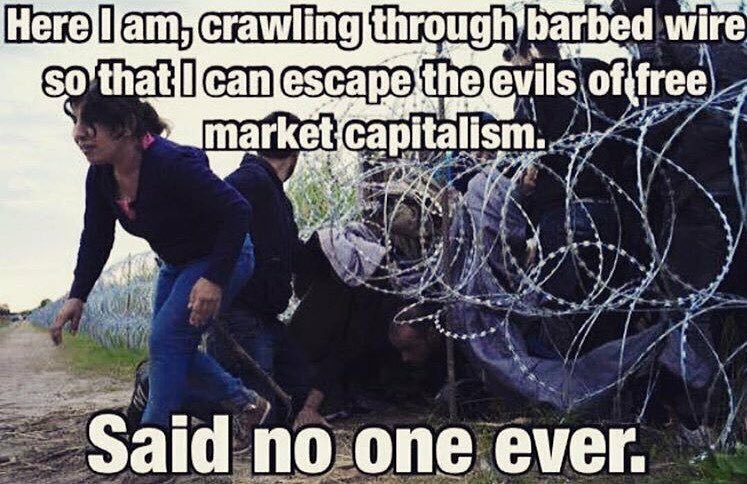 And their feet make them flee towards capitalist countries and away from socialist countries. Always. "The great revolution of the twentieth century will turn out to be the liberal revolution - by 1970 it was already patently obvious that the socialist revolution had failed everywhere." "In the past five hundred years, perhaps in all history, there has only been one genuinely successful revolution - one that delivered on its promises for a better world, based on the principles of freedom, equality, enterprise and endeavour; one that actually succeeded, despite the acknowledged imperfection of some of its outcomes. ... It was the American Revolution of 1776. That's the only one that has ever really worked." - Rob Foot, The New Anti-Semitism? "in the long violent saga of mankind we have rarely done anything as benign as going shopping, rarely devised anything as socially advantageous as property rights and the rule of law, rarely enriched the poor or enhanced lives as we did by creating capitalism." - Daniel Finkelstein on those who criticise capitalism.